Let’s look at what makes up a chat or a party, because they are different. Yes, chats and parties both live on Twitter and include a relevant hashtag for search and participation purposes. However, chats are more laid back and geared toward businesses, groups, and individuals who want to discuss a pre-determined topic in a specific field of interest. Parties are more formal and are sponsored by brands that pay a host to run it for them, and the topic is, of course, about the brand. Start thinking of themes, questions, hashtags (I’ll talk about this later), and prizes now! A Twitter chat is the online version of a social club. Most of them meet weekly at a designated time to discuss relevant topics previously chosen by the host. Chats are a casual event because they don’t require a reservation or registration. Participants are encouraged to join in at the appointed time and use the appropriate hashtag. Sometimes this hashtag changes so it’s important to check-in beforehand to know which one you should be using. Twitter chats aren’t only social media, digital marketing, or online-topics specific. Chances are if you’re interested in it, there’s a chat for it. That also means that chats aren’t only hosted by businesses. Groups and individuals (sometimes even brands) host them to bring like-minded people together in conversation about what they love. If your interest lies in the medical community, but you want to know more about agriculture, join a chat! The opportunity for networking, socializing, and learning about other businesses are huge! Brands can participate in chats as well, by not forgetting to look for a chat that aligns with their goals. If you’re noticing a chat that is reaching your audience and/or talking about your topic, join in! After you’ve participated in one or two chats, reach out to the host and ask about a sponsorship. The next chat might include a mention of your brand, a banner on the chat’s page, or an opportunity to ask questions. Sponsorships from Twitter chats have a less restrictive policy, so if you get the chance to have one, be creative! · Be polite: Everyone is there to have fun, learn, and talk about his or her interests. · Don’t talk about yourself (too much): If you’re only there to turn the conversation to you, maybe you shouldn’t be there. However, if you have an experience relevant to the topic/question, that could be valuable to someone else. · Interact: If you agree with a participants comment, feel free to say so. If you like a question, voice that. Like tweets, retweet, and others will return the favor. Did you know that Twitter parties originated eight years ago? They don’t happen very often (although they could be done weekly), and they typically include a sponsorship from a brand. Organization is extremely vital for a party seeing as there are rules and guidelines participants need to follow. A host gets paid by a brand to run the party, and in return, the host gathers their top resources for the party which can include a diverse variety of things such as: influencers, blog posts, giveaways, events, etc. The host and the sponsor work as a team to decide what the topic will be, and additional features they want the party to have. Parties are also more formal than chats. Think about a party that you’ve attended. Was there an RSVP giving the time, place, possible dress code, and directions to the party? The same applies to a Twitter party. An RSVP is your virtual guest list telling you who is planning on attending the party. If you’re giving away a prize or two during your party, check your guest list to make sure the winner actually attended the party and participated with the hashtag. 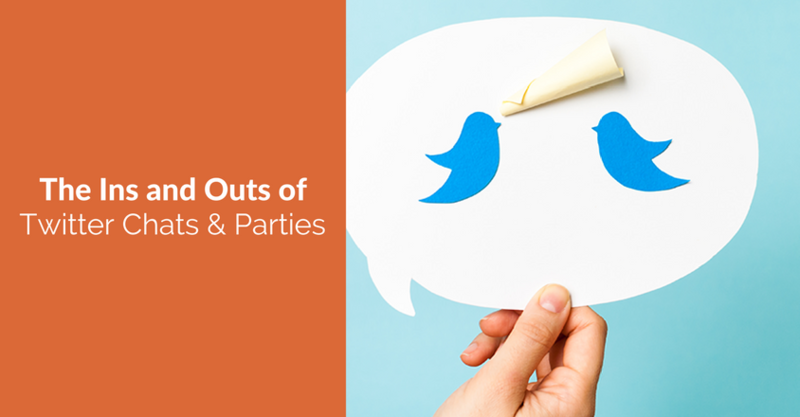 Twitter parties provide an amazing benefit to not only brands but the participants as well. This is give and take at its finest. Typically parties consist of women, either hosting or engaging. Men’s products and/or brands can make a name for them here and break new ground. Organization matters greatly in a Twitter party. To keep from losing the structure, apply these rules that need to be followed by both the participants and the host. · Be polite: This is important (and obvious) no matter if you’re in a chat or a party. · Don’t ignore yourself: This is the opposite of a chat. Since a brand is sponsoring a party, the topics and agenda for the party are partly created by the brand, so, of course the brand is going to come up, and that’s okay! Make sure it’s relevant, though. · Interact: Like, retweet, and respond to tweets. Show the participants that you’re listening to them and not only letting tweets scroll on by you. If you’re a participant in a party, this needs to be done to show the brand that you’re listening as well! · Follow through: As a brand, you may be offering prizes and giveaways, and that’s great! After you’ve chosen a winner, get their information right away. As a winner, provide your information as quickly as possible. A hashtag is arguably the most important aspect of a chat or a party. Hashtags are used for search on Twitter. When a user searches for a particular hashtag, they can choose a conversation based on that hashtag. If you know there’s a chat or party that you’re interested in but not able to attend, the hashtag allows you to come back later, search for it, and see what you missed. It’s what keeps your chat or party organized. Every time you compose a tweet based off of a topic, use the hashtag for it. You’ll be able to reach more people with one than without one. If you want to win a prize, chances are one of the rules is that you’ve used the hashtag. By using a designated hashtag, you’re conversing with that group and not all of Twitter. At times you may use more than one; one for the party itself, and one for the topic/brand. Brands or businesses should set up a platform that allows them to search for the hashtag and see only that, making it easier to respond to the participants in the chat or party. Some of them even add the hashtag automatically into your tweet if you’re tweeting directly from that platform. 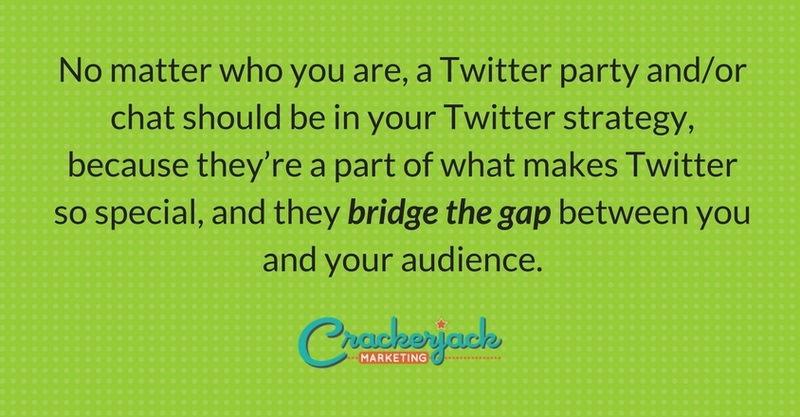 No matter who you are, a Twitter party and/or chat should be in your Twitter strategy, because they’re a part of what makes Twitter so special, and they bridge the gap between you and your audience. Get creative! Now’s the time to show your followers that you not only want them to know you but that you want to get to know them! How do you get to know someone? You chat with them of course! 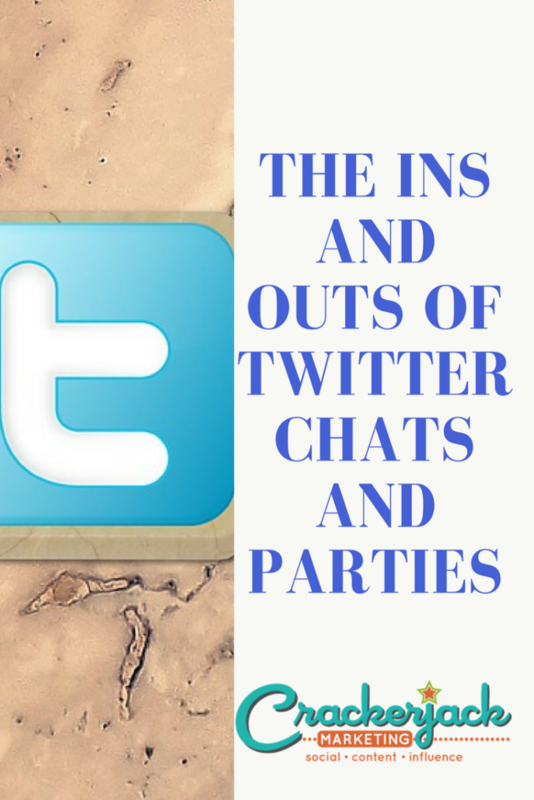 Have you hosted or participated in a Twitter chat or party? Please let us know in the comments.